Havelock City, the premier integrated mixed-use development project in Sri Lanka, conducted the ground-breaking ceremony for its Commercial Development recently. The on-time completion of the piling works paved way to commence construction of the super structure, which will be completed by 2021. The construction contract was awarded to China Harbour Engineering Company Ltd., which has its global footprint in over 100 countries. Havelock City, the brain child of S.P. Tao, is developed by Mireka Capital Land, a fully-owned subsidiary of Overseas Realty (Ceylon) PLC, the owner, developer and manager of the iconic World Trade Centre in Colombo. 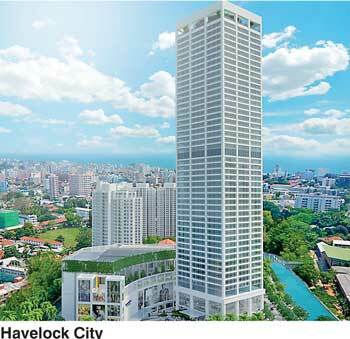 The Havelock City Commercial Development was designed by the globally-renowned Palmer & Turner Group, Singapore. It comprises a 50-storey office tower and a shopping mall built to international standards, which will be an iconic landmark in the vicinity. The office tower housing Grade A premium office space is designed to be a LEED Gold certified building and will be built to the highest standards that enable efficient space planning through column-free wide floor plates and a smart functioning infrastructure. The overall design, built quality and facilities will enable businesses an unparalleled competitive advantage. The shopping mall is being developed as a community level mall serving the lifestyle needs of the catchment. A miniature heaven for ardent shopaholics, the mega mall will comprise six floors of both local and international fashion brands and dining and entertainment experiences along with a state-of-the-art multiplex cinema. Additionally, the two basement levels of parking with ample space to park over 800 vehicles will complement the convenience and vibrancy offered by the Havelock City Commercial Development. The Commercial Development of Havelock City will be the visual anchor of Havelock City Residencies, which comprises eight magnificently-designed apartment towers on 18 acres of prime land in Colombo.